There are times you want to prop your iPad up for hands-free use, and a good stand lets you do just that. While there are plenty of portable iPad stands out there, stationary (or desktop) stands tend to be a bit sturdier and more stable. 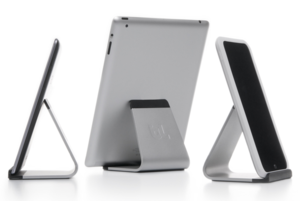 (See all our iPad-stand reviews.) I took a look at eight stands designed for the desktop or floor to see how they compare. Before you buy a stand, it’s important to think about how and where exactly you plan to use your iPad. Are you looking for a solution for a business setting? Will you instead be using your iPad primarily in the kitchen, so you can follow a recipe or watch a video while you cook? Or are you looking for a couch companion, to relax with an e-book or movie? Each of these stands I tested will suit different needs, so keep your needs in mind as you read along. 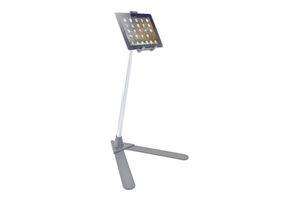 The Arkon Tab-Stand (3 of 5 rating) comes in two sizes; the $90 Tab-Stand1 (also known as the “4" Extending iPad Floor Stand with Quick Release Holder”), designed to be set on the ground like a podium stand, and the $40 Tab-Stand2 (also known as the “10" iPad & iPad Mini Table Stand with Quick Release Holder”), intended for tabletop use. The design of both versions is the same—which size you choose is just a matter of how you plan to use your iPad. The Arkon stands are made of plastic and metal, and they accommodate any size iPad, including the mini. (It also fits other brands of tablets.) However, the stands hold a full-sized iPad only in portrait mode. That said, the stand’s cradle is quite adaptable, letting you keep your iPad in a non-bulky case; you can adjust the height of the cradle and iPad angle (from roughly vertical to 45 degrees from vertical). The stands’ cradle doesn’t block any ports or buttons. 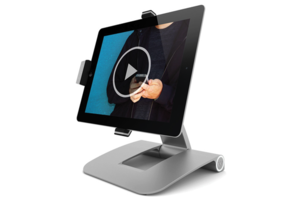 The Arkon models are each the sort of stand that comes to mind when you think “iPad Stand.” They’re not exciting, but they’re functional and versatile. Some iPad stands have one very specific use case, and Heckler Design’s $129 WindFall for iPad (4 of 5 rating) is one of those. It’s designed for business settings, to let you use your iPad as a point-of-sale stand or a display for customers. You use the included hex wrench to lock your iPad securely in the stand, with an opening to allow the use of a credit-card dongle. The WindFall accommodates the second-, third-, and fourth-generation iPads, though only bare or with a thin decal/skin. Like Heckler Design’s @Rest iPad stand, the WindFall is constructed from a single, heavy piece of metal and is quite sturdy. The WindFall holds your iPad only in landscape orientation, and at just one angle (roughly 45 degrees from vertical). Your iPad’s top and bottom buttons and ports are accessible, while the tablet’s side switch and volume buttons are blocked. You can use the stand for showing videos, typing and tapping on the screen, or with an external keyboard, but whatever you use it for, your iPad isn’t going anywhere—once it’s in the WindFall, it’s in—you’ll need that hex wrench to remove it. Heckler Design sells various accessories you can use to lock the stand itself in place to prevent theft. This isn’t a stand for casual or home use. But if you’re looking to use your iPad for customer interaction at your place of business, the WindFall might be the answer. Mophie’s $150 Powerstand (4.5 of 5 rating) is constructed primarily of aluminum, but with soft-rubber pads wherever the stand comes in contact with your iPad. You can easily switch between landscape and portrait orientation, and the stand adjusts to any angle from horizontal to completely upright. In addition, you can adjust the height of the Powerstand within a range of several inches to get the perfect viewing position. The Powerstand is quite sturdy and stable—even on a bed or couch it’s difficult to tip over. You can use it with an external keyboard, but its hinge is also sturdy enough for on-screen typing. The variety of angles lets you get the right angle for watching videos, surfing the Web, reading a book, or video chatting. The fit is very good, thanks to adapters that customize the fit for each iPad model. In other words, this is a very good all-purpose stand. 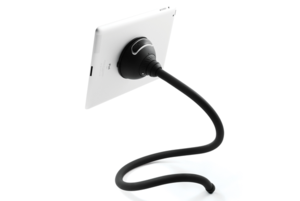 What makes the Powerstand unique, however, is that it also features a 30-pin dock connector in its cradle, along with a USB port in the base, so that you can charge and sync your iPad while it’s in the stand. (This does mean, however, that the Powerstand works only with full-size iPads that use a 30-pin dock-connector port—it doesn’t work with Lightning-connector iPads.) The included USB cable can plug into your computer or the included AC charger. Note that while Mophie is well known for its battery-focused accessories, the Powerstand does not have its own battery. The Powerstand folds down for travel, though it’s not especially lightweight—it’s a desktop stand, through and through. It’s main drawback is that you’ll need to remove any iPad case in order for your iPad to fit in the Powerstand. Other than that, the Powerstand is solid. 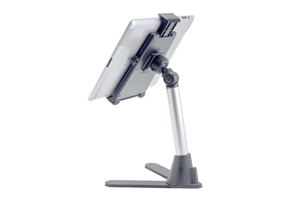 XFlex’s $100 XFlex Tablet Stand (2.5 of 5 rating) is composed of rubber, plastic, and metal. The base takes the form of a big rubber “X,” the neck is flexible, and a suction cup at the top attaches any iPad (or any other device with a flat, smooth back). In my testing, the suction cup adhered securely to my iPad both bare and in a smooth, hard-plastic case. You can position your iPad in landscape or portrait mode, and the angle is adjustable, though not so much that you could get the tablet flat enough to type comfortably on the screen. On the other hand, if you use a Bluetooth keyboard, the XFlex’s positioning of your iPad about a foot off the desk or table makes for a more-ergonomic setup. The stand keeps all ports and buttons fully accessible. Once you secure the stand itself, it does keep the iPad in place and makes for pleasant video-viewing or reading. That said, I wouldn’t choose the XFlex for everyday use, due to its top-heavy nature. I’d be worried that the stand would tip over and my iPad would crash onto a hard surface. In addition, the fact that you depend on a suction cup makes me even more nervous, despite the suction cup working well in my testing. The biggest advantage of this stand over some of the others I tested is that fact that it’s compatible with virtually any brand of tablet. Its flexible neck also might allow you to use it in places that other stands wouldn’t. Twelve South’s $80 HoverBar Adjustable Arm for iPad (3.5 of 5 rating) is advertised mainly as a way to use your iPad as a second screen for, or alongside, your computer, though it ends up being a bit more versatile than that. Designed primarily for use with Macs, you attach the HoverBar’s clamp to the L-shaped stand of your iMac or Apple display display, or to the lip of your desk, so the stand takes up very little desk space while keeping your iPad conveniently close. You can also attach the stand to a counter to use your iPad in the kitchen while keeping it out of the way of splashes and food splatters. The HoverBar is constructed of metal with the aforementioned clamp on one end and a plastic iPad frame on the other. You use an included hex wrench to lock the clamp into place—the HoverBar isn’t meant to be moved from place to place. When your iPad is in the HoverBar’s frame, all buttons and ports are accessible. However, that frame requires a bare iPad—you can’t use an iPad case with this stand. Apple’s Smart Cover and similar screen covers are compatible, though when you open the cover, you must either either remove it from the iPad or let it dangle behind or down. The HoverBar is limited to particular uses, but it performs well in those scenarios. If you want simple, Bluelounge’s $40 Mika (3.5 of 5 rating) is the way to go. This stand is just a curved piece of aluminum with black-plastic strips wherever your iPad contacts the stand. This design means that any iPad—or any tablet or any smartphone—can take advantage of the Mika, and you can even keep your iPad in a case as long as that case isn’t terribly bulky. The Mika can prop up your devices in both landscape and portrait orientation, though at only a single angle of about 60 degrees from horizontal. That angle is quite comfortable for reading or viewing, and the stand is secure enough for you to tap on the screen, but onscreen typing is awkward. If your iPad is in landscape orientation, all buttons and ports are accessible; of course, when the iPad is in portrait mode with the Home button at the bottom, the dock-connector or Lightning-connector port port is blocked by the stand. You’ll want to use the Mika on a hard, flat surface, because only gravity holds your iPad in place—if you use the stand on a soft surface such as a bed or a sofa, the iPad can easily tip out. The Mika has no bells or whistles. It doesn’t fold down like many smaller stands do, so despite its compact size, it’s not really portable. But if you just want to prop up your iPad in your home or office, the Mika is an elegant option. Octa’s $100 TabletTail: Monkey Kit (3.5 of 5 rating) is a bit different. It’s actually two pieces: a big suction cup and a long, flexible tail that’s covered in plastic but that’s obviously got quite a bit of metal on the inside. You can use the suction cup alone as a small tabletop stand, though I found that because it’s a half-sphere, I had to place it just right to avoid the iPad tipping over when I typed on the screen. Add the tail, and you can place your iPad anywhere: You can wrap the tail around a bar, wedge it between couch cushions, or coil it so that it stands alone on a desk. You might even be able to rig it up in the car for people in the back seat to watch a video. However, I found that while the stand worked well when wedged in the couch, it wasn’t very sturdy as a standalone desk stand. You can manipulate the Monkey Kit to display your iPad at essentially any angle, in either landscape or portrait orientation, and because it attaches to the back of your iPad, all buttons and ports remain fully accessible. Since the suction cup attaches to the back of your device, it will work any iPad or other device larger than the suction cup itself. You can even use it with an iPad as long as the case is hard and smooth. When you attach the suction cup, you press a button to pump the air out. Over time, as air leaks in, that button will start to pop back out, so you need to press it occasionally to maintain solid suction. It’s not hard to do, but you have to remember to do it—and if you don’t, your iPad can fall off. That aside, if you want a multipurpose stand that stands out of the crowd, the TabletTail: Monkey Kit is worth a look. Among this batch of iPad stands, there’s no clear “winner”—each has different strengths and weaknesses. If you’re looking to use your iPad in a business setting, Heckler Design’s WindFall is the way to go, as it makes for a nice iPad-based kiosk and it will help keep your iPad from wandering off. Bluelounge’s Mika or Arkon’s smaller Tab-Stand2 are more basic options for your desk. Arkon’s larger Tab-Stand1 makes for a good lectern or music stand, while Twelve South’s HoverBar is great for use at your desk if you don’t have a lot of free desk space. For iPad use in the car or other non-traditional places, Octa’s flexible-necked TabletTail: Monkey Kit may fit the bill. Mophie’s Powerstand comes the closest to being an all-purpose stand. It works at the office, in the kitchen, or on the couch, and its flexible positioning ensure that you can do just about anything with it. The fact that it doubles as a charge/sync station is a huge advantage. However, its relatively high price and the fact that you can’t use it with an iPad case keep it from getting an unreserved recommendation. Arkon's Tab-Stand models aren't exciting, but they're functional and versatile. 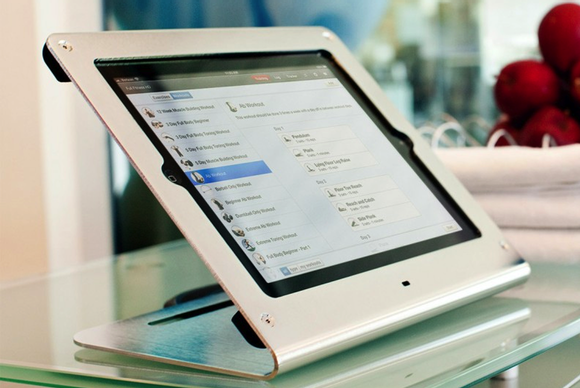 If you're looking to use your iPad for customer interaction at your place of business, the WindFall might be the answer. 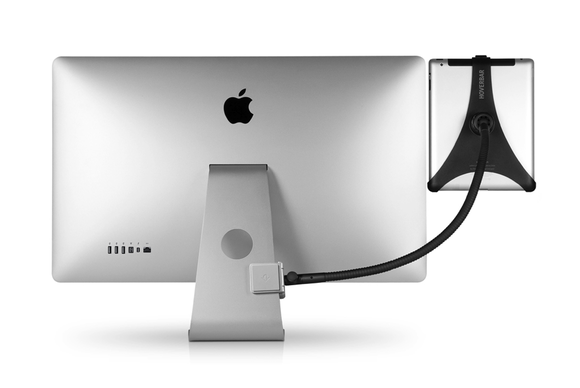 Mophie's Powerstand is both a stand and an iPad charge/sync dock. It works well, though you'll need to remove any case your iPad might be wearing. The XFlex Tablet Stand is versatile; however, with a heavier tablet, the setup isn’t very stable. If you're looking to let your iPad be a "second screen" in your computer setup, or a cooking companion in the kitchen, the HoverBar is a solid choice. The Mika is as simple a tablet stand as you’ll find. But it’s also elegant and effective. If you want a multipurpose stand that stands out of the crowd, the TabletTail: Monkey Kit is worth a look.